New series! How far would you go to save reality? 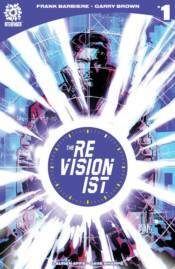 Martin Monroe is The Revisionist-a time-traveling assassin tasked with repairing our fractured timeline. Forced to place his trust in his estranged father, Martin will have to overcome his troubled past to save the future-but can he live with his decisions? Join the all-star creative team of writer FRANK J. BARBIERE (Five Ghosts, Avengers World), artist GARRY BROWN (Black Road, The Massive), and colorist LAUREN AFFE (The Paybacks, Turok: Dinosaur Hunter) for the first chapter of an all-new action/sci-fi adventure about fathers, sons, and time travel!